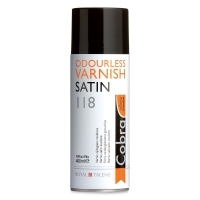 Cobra Painting Varnishes offer protection against aging, dust, and dirt. When applied to thoroughly dry oil paintings (between 6 to 12 months after painting has been completed), Cobra Painting Varnishes give paintings an even sheen, adhere well to the underlying paint layers, and will not crack or yellow. Apply varnish in a well-ventilated room. Both the painting and the varnish must be room temperature when using. The varnish dries within a few hours. Dry layers of varnish can be removed even after many years, using odorless white spirits. Cobra Painting Varnishes are based on synthetic resin, odorless white spirits, and matting agents (with the exception of the gloss varnish).